In the past few years, chatbots have really had a chance to grow and dive into the mainstream. While most of the chatbots today are used for customer support, to find revolutionary, new uses for them. But when it comes to industries using chatbots, some are a more natural fit than others for a variety of reasons. Chatbots or smart algorithms conducting conversation via auditory or textual methods are becoming more and more popular and widespread. Chatbot, which began as a fairly unknown niche concept in technology, is now turning into the biggest necessity for mainstream businesses. It’s no surprise many companies are moving to chatbots and AI. 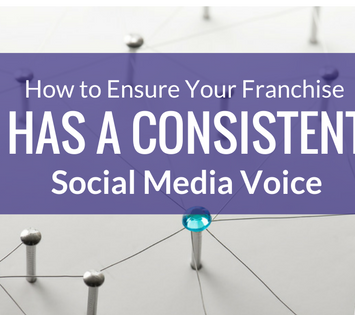 As businesses grow and reach levels of impossible demands of engagement from workers, new methods must be adopted to assure unhappy or curious customers, the level of engagement and conversation they expect when contacting a company. 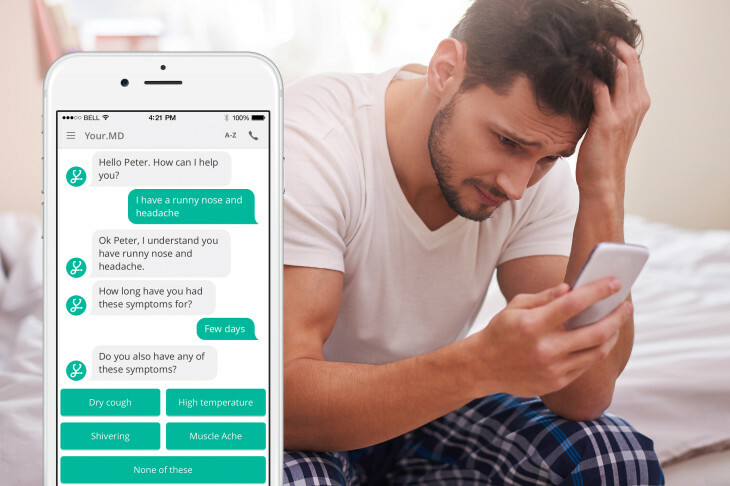 Health chatbots are available to connect patients with clinicians for diagnosis or treatment, but that is already one step further down the line. The general idea is that these talking or texting smart algorithms might become the first contact point for primary care. Patients will not get in touch with physicians or nurses or any medical professional but will turn to chatbots first. If the medical chatbot helper could not comfortably respond to the raised issues, it will transfer the case to a real-life doctor. Some of the promising ones are below. 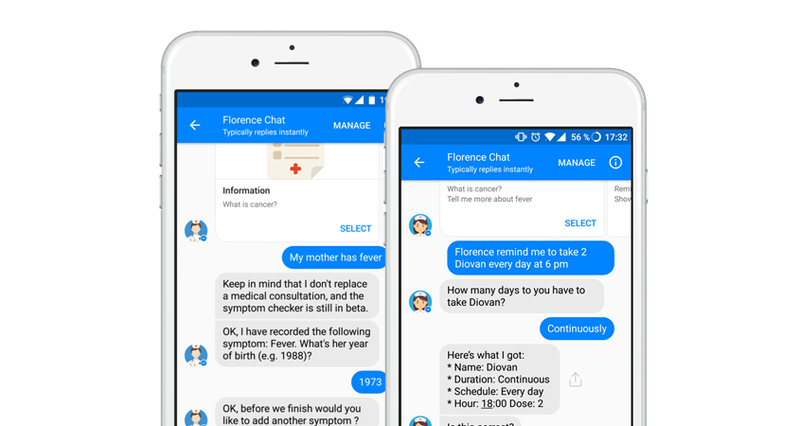 The chatbot is basically a “personal nurse”, and works on Facebook Messenger, Skype or Kik. It can remind patients to take their pills, which might be a handy feature for older patients. You just mention the name of the medicine in chat, the number of times a day you must take it and at what time. It acts as the best friend or a remainder who reminds or looks after you for taking the medicines. Then, Florence sends you a message in chat every time you must take the pill. Moreover, it can track the user’s health, for example, body weight, mood or period, thus helping them to reach their goals. It also has the skills to find the nearest pharmacy or doctor’s office in case you need it. 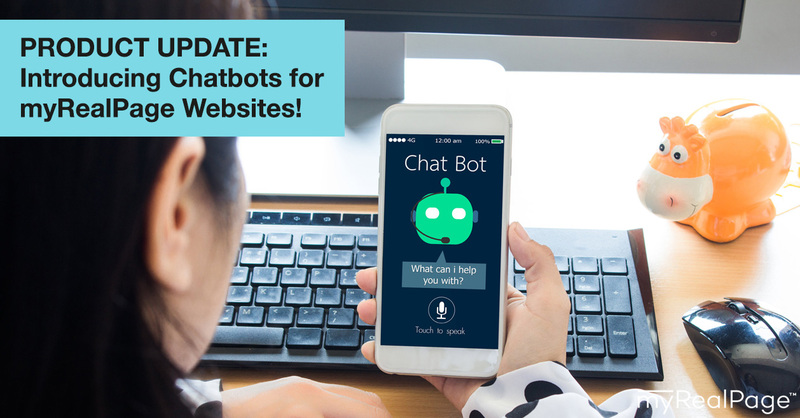 You may be wondering that why should you use news chatbot rather than using websites and applications for news. 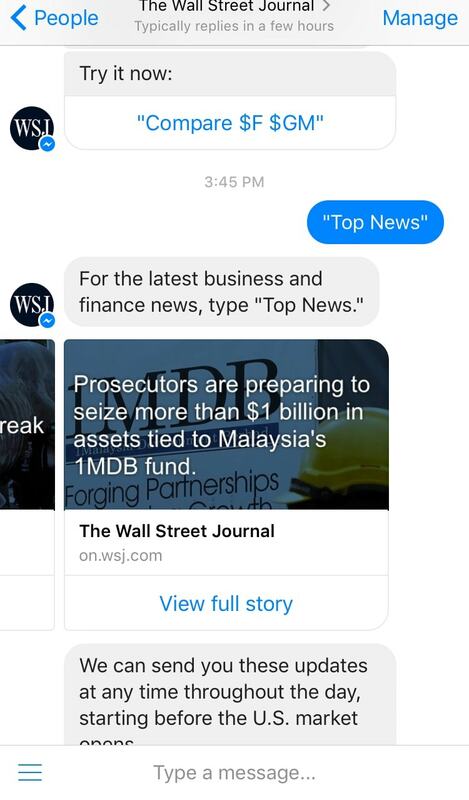 There are many benefits of using news chatbots. First, you don’t have to open apps every time you want news. Moreover, it can save space on your mobile phone if you use news chatbot. Here is the list of some useful ones. These news Chatbots provides you news of all categories including Politics, Media, Music, Technology, International. If you show interest in the business and companies around the world than this chatbot is a must for you. It will give daily digest about the latest happenings in the business around the world. It provides with all the latest updates regarding your favorite topics. 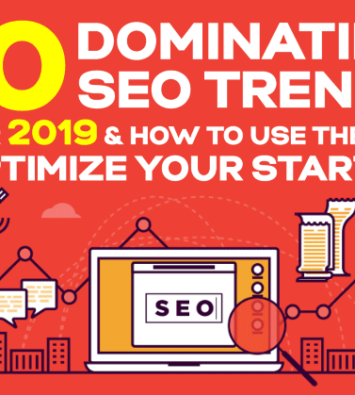 You can search for the company and it will give you the latest news about it or you can also follow as a favorite so that you can stay aware of all the updates about that company. It is a leading source for innovation in the field of news. They are always ahead in covering news related to emerging technology trends. Venture Beat helps to keep updated to the latest technologies and emerging trends. It allows to follow the favorite content and also gives a notification everytime you miss an update. If you are a tech enthusiastic then this news chatbot is a must for you. You can get the latest news, curated news as well summaries for the latest news. It mainly focuses on Weird and interesting news from the topics you choose. The topics include mathematics, numbers, technology, innovation etc. 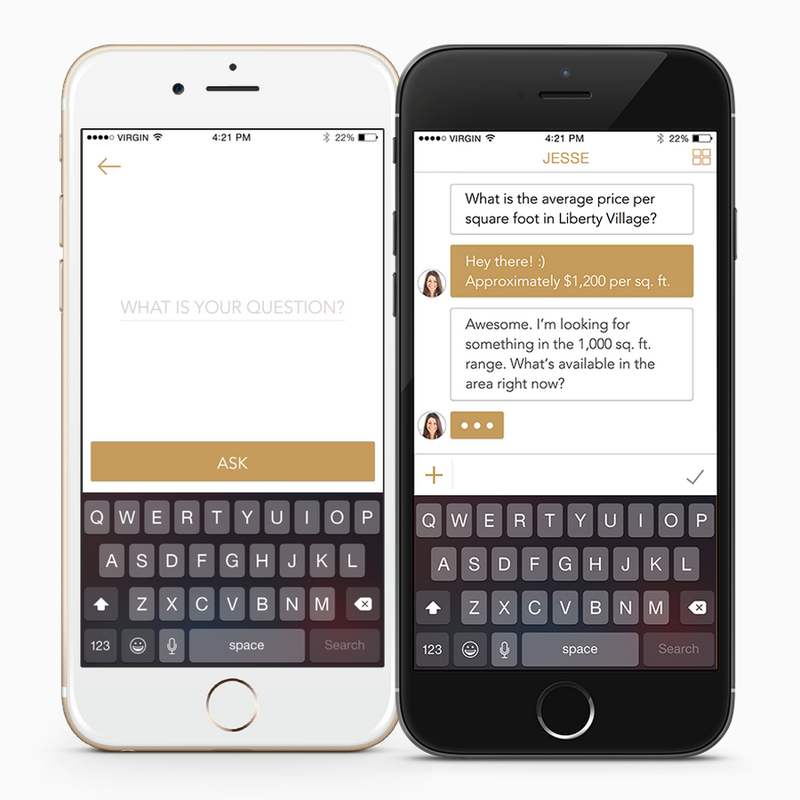 This chatbot helps you stay updated in your interested field. 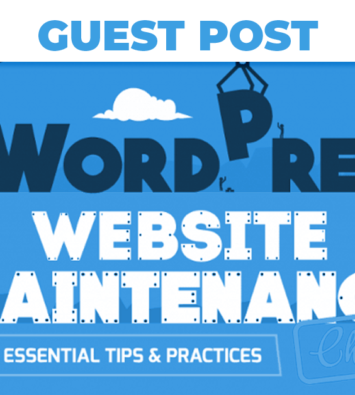 It provides you with any kind of topic in precise details and lets you set ahead in your favorite field. You only have to start following or send a request to join your content and voila, you get a bunch of things right in front of your mobile screen. Chatbot steps in and automates the customer service process altogether, leaving most of the customers either happy with their conversations or making unaware whether the recipient on the other side of the conversation is even human. Few of the chatbots with unique features are as below. 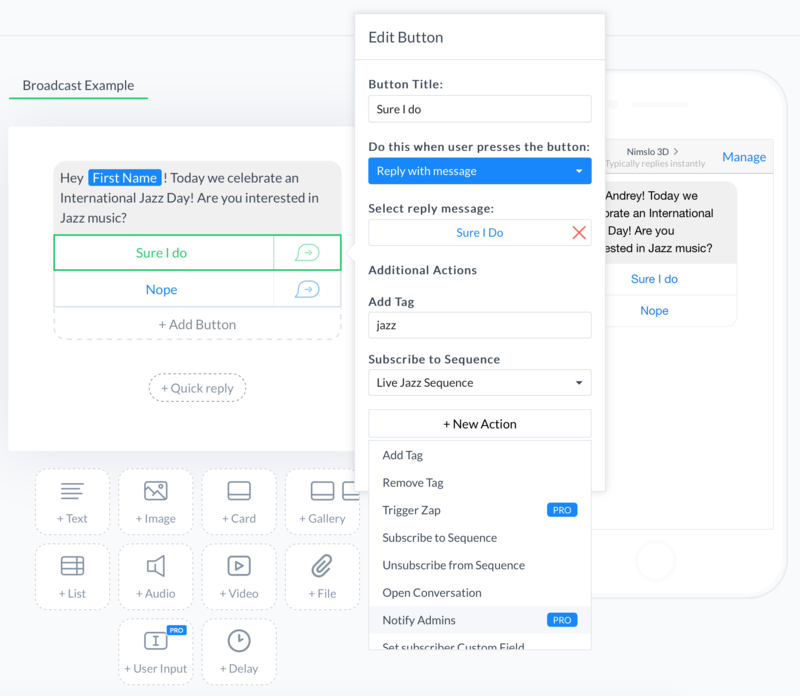 This chatbot offers accessible tools and a wonderful UI-UX design that appealed to many users when trying to choose the best one to work with. It’s a great platform for people without coding skills, which promises a new beginning for the masses to begin interacting with bot implementation. It allows multiple chats from various persons to solve their queries or reviews. The feature of reviewing or solving the queries helps a person and boost customer sales. Dialogflow is considered icing on the cake among AI and Natural Language Processing platforms. 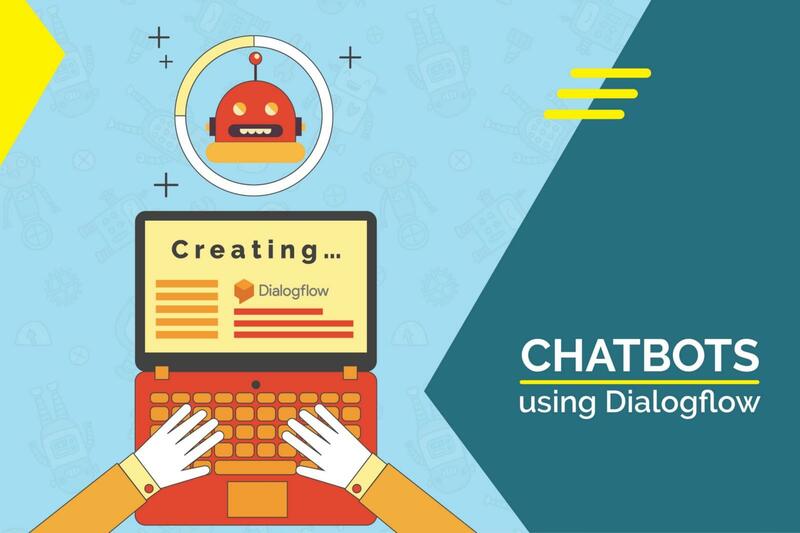 Integrating both voice and text AI applications to Google Assistant, Microsoft Cortana, and Amazon Alexa, that’s the reason why Dialogflow is the most respected and well-known chatbot language processing tool for companies with wide customer bases. A brand new agent who has ZERO leads and lots of time to run on business have different marketing priorities than the 30-year veteran agent who gets enough referral business alone to be successful. The real estate chatbots are very important to the people looking for a new place or shifting to a different place or lease the place. Fortunately, there are so many different types of Chatbots, that there is something out there for veteran agents and newbie realtor alike. It is a mobile chat app for real estate websites that offer a fast and hassle-free way to communicate with your online visitors, in real time. It is made for real estate, official messaging partner of RE/MAX with 20,000 agents using the platform, connected to email means AskAvenue will follow up with missed chats via email reply, responsive chat window, and get notified of real-time chat requests via a mobile phone application. 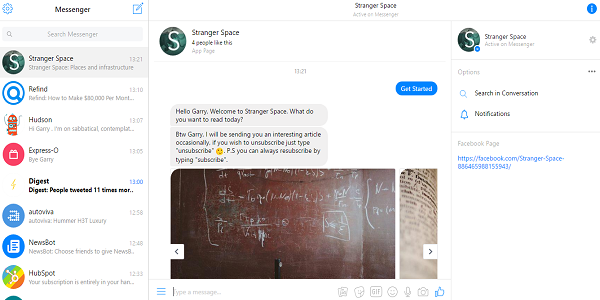 It is always learning from conversations and growing autonomously, can name your bot whatever you want, can speak to it via live chat app or SMS, specifically built for residential real estate agents, seamlessly integrates with Facebook Business Page and messenger, asks various qualifying questions to identify lead quality, asks for contact information regularly, can display listing photos directly in chat window only upon request. Entertainment is a time when people can relax, have some fun and forget about routine for a while. But, people do not often have time for other extra activities in today’s world. 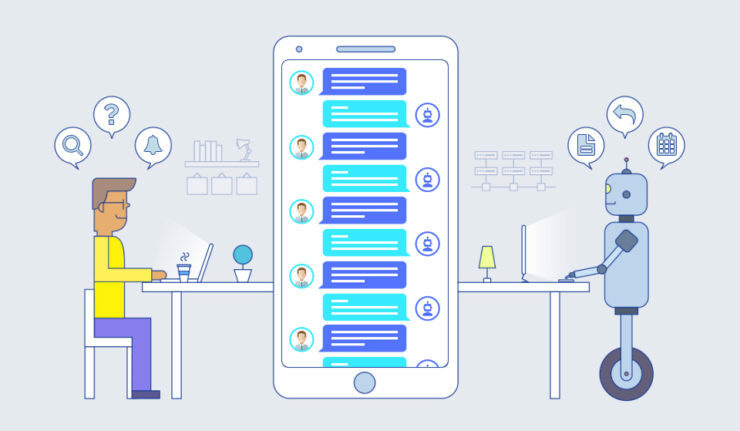 Nowadays, most of the time is spent on their smartphones and so the developers have introduced unique activities featured chatbots in mobile apps. It is a quiz chatbot. It offers variant groups of quiz questions such as General Knowledge, Game of Thrones, Games, Sports, the 90s, Technology, TV, Soccer, Movies etc. It asks you to choose from their varied topics and then starts the quiz. The quiz begins with the questions you know and also helps to gain some extra knowledge. So, now onwards when you are bored, just head on with your favorite content and enjoy the quiz. We have advanced from simple messages to the trolling memes nowadays. 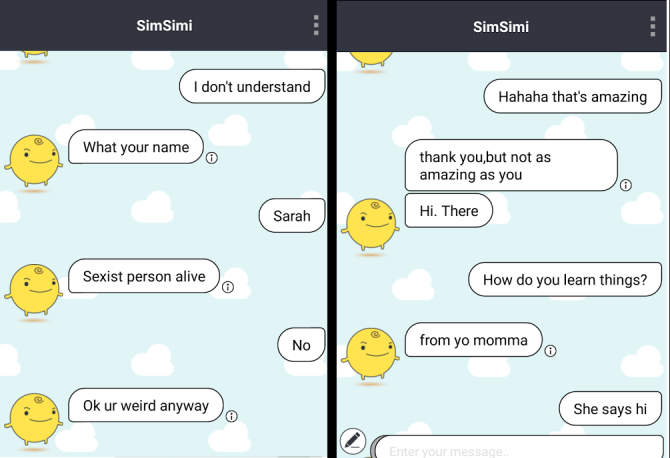 Simsimi chatbot seems to have been influenced mostly by internet trolls and memes. It is greatly influenced by the trolls and memes. Helps in relieving pressure and get a lighter laugh. It also encourages you to report any crude or explicit statements from the bot. It can reply with some hilarious statements that trolls have taught the bot. Overall, it helps to lift up your mood at the end of the day. We have defined how chatbots are associated with different industries. Also, we saw why chatbots should be implemented in different industry. We also looked after healthcare chatbots which will save your time and money. Customer’s satisfaction is increasing. Chatbots successfully serve their clients. When they can have some fun and forget about routine for a while. 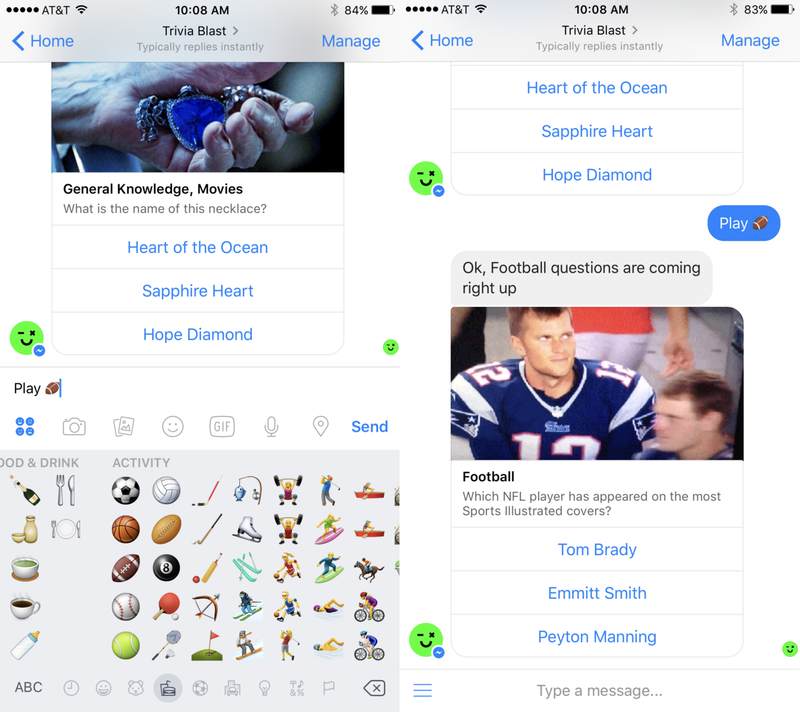 But, people do ... One of the most spread chatbot games in Facebook Messenger is MojiHunt. 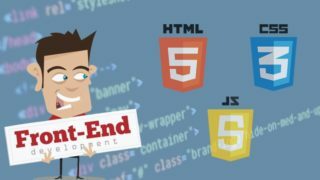 Rooney Reeves is a content strategist and a technical blogger associated with well known firm for eTatvaSoft – Web & Mobile App Development Company in India. An old hand writer by day and an avid reader by night, she has a vast experience in writing about new products, software design and test-driven methodology. 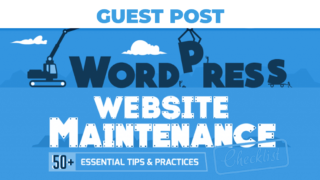 Her write-ups mainly features anything and everything related to the web! 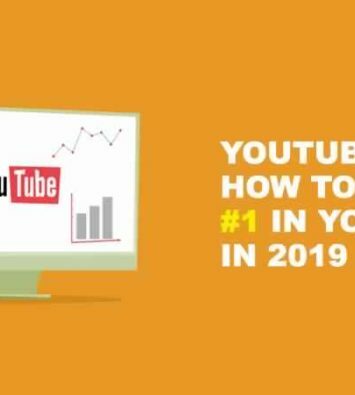 With the true passion for creating compelling content for online and offline media, Rooney has donned multiple hats over the past several years.